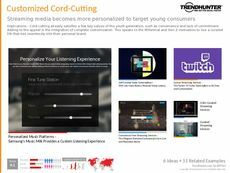 Find Better Ideas, Faster ® with a custom movie experience trend report, our PRO Dashboard and 80+ categories of premium trend reports. 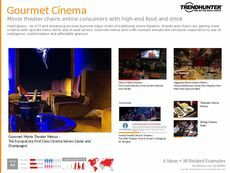 Advances in technology and shifts in consumer viewing habits will all be explored in the Movie Experience Trend Report. Streaming services like Netflix have altered movie viewing, creating an in-home alternative. 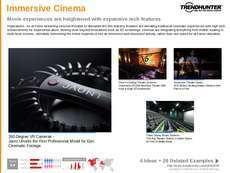 To combat this, movie theaters are offering immersive and interactive experiences to entice modern movie-goers. Through technologies like 3D and 4D theaters, augmented reality and virtual reality, the movie experience has shifted to make viewers feel as though they are placed within in the movie itself, rather than being a passive observer. This report is ideal for professionals in the film industry, specifically movie theater executives, studio executives, tech developers and programmers. 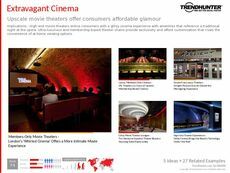 Furthermore, our research will inform you on demographic preferences, showing what types of movie experiences are best resonating with modern viewers. 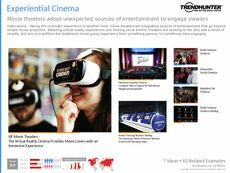 The Movie Experience Trend Report is an all-encompassing look at the shifting perspectives consumers have regarding cinema. Use our research to keep track of this fast moving industry, and expose yourself the the various technologies and innovations that are transforming the way we see movies.